Welcome to the Finnsheep Online Pedigree Site. Here you can browse through the pedigrees for all sheep registered with the Finnsheep Breeders’ Association. You can also use our Breeders Directory to find Finnsheep breeders in your area. The Finnsheep Breeders’ Assocation provides record keeping for registrations and transfers of Finnsheep in the USA. It also serves as a communication link among its members and others interested in the breed. Finnsheep are a multi-purpose breed. In their native Finland, where they are known as Finnish Landrace Sheep, they are raised for meat, wool and pelts. 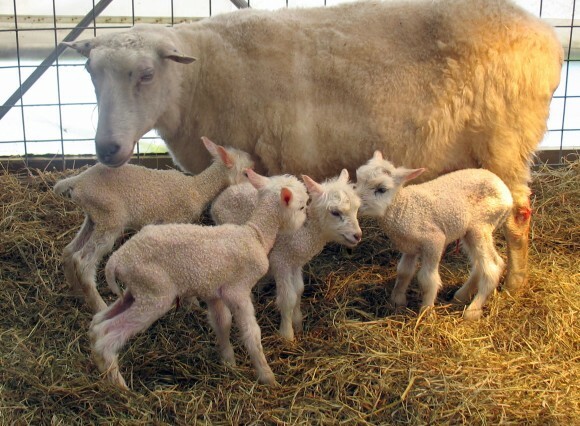 In the United States, their primary use has been in cross-breeding programs to increase the lambing percentage of commercial flocks. Recently, Finnsheep have been discovered by American handspinners for the color, luster and soft hand of their wool. An emerging market is the use of Finnsheep to produce lean meat favored by “ethnic” populations. Finnsheep are friendly, docile and easy keepers producing vigorous lambs that are up and nursing within minutes. Please Note: This website displays data from a copy of the official FBA registry database. The database is updated approximately quarterly. See the page footer below for the dates of the most recent database update as well as the next scheduled update. Any changes or additions made to the official registry database since the last update of the online database will not be reflected here. Errors or Inconsistencies: Occasional errors or inconsistencies may appear in the pedigree database due to initial breeder or registry recording errors. If you find an error in the information listed for one of your animals that you would like corrected, please report it to the FBA Registrar.